There are many situations when writing React where you’ll want to pass a function to a prop. Usually it’s to pass a callback down to a child component so that the child can notify the parent of some event. It’s important to keep in mind the binding of the function – what its this object will point to when it’s called. There are a few ways to make sure the binding is correct, some better than others. This post will go over the options. If you’re using React.createClass, the member functions in your component are automatically bound to the component instance. You can freely pass them around without calling bind, and you’re always passing the same exact same function. When using ES6 classes, React does not automatically bind the member functions inside the component. Binding at the last second like this is one way to make it work correctly, but it will hurt performance slightly because a new function is being created every time it re-renders (which could be pretty often). The trouble isn’t really that creating a function is an expensive operation. It’s that by creating a new function every time, the component you’re passing it to will see a new value for that prop every time. When it comes time to tune performance by implementing shouldComponentUpdate, that constantly-changing prop will make it look like something changed when really it’s the same as before. Similar to the above example, except this one uses an arrow function instead of calling bind. It looks nicer, but it still creates a function every time render is called! No good. This method works by setting handleClick to an arrow function one time when the component is created. Inside render and in other functions, this.handleClick can be passed along without fear because the arrow function preserves the this binding. This one is labelled “ESnext” because it’s not technically part of ES6, ES7, or ES8. ES2016 and ES2017 have been finalized already, so if and when this makes it into the spec, it’ll likely be ES2018 or beyond. Even though this is supported by Babel, there’s a (small) risk that this feature could be taken out of the spec and require some refactoring, but a lot of people are using it so it seems likely that it’ll stay put. You can set up the bindings once in the constructor, and then use them forevermore! Just don’t forget to call super. Once again, ES2016/ES7 doesn’t include this feature so you’re accepting a bit of risk by using it in your code, even though Babel does support it. // will call it with the id. // can just pass it along. There’s a tradeoff with most of these methods: more (and more complex) code in exchange for some theoretical performance benefit. “Premature optimization is the root of all evil,” said Donald Knuth. So… before you split up or complicate your code to save a few cycles, actually measure the impact: pop open the dev tools and profile the code and use the React performance tools. 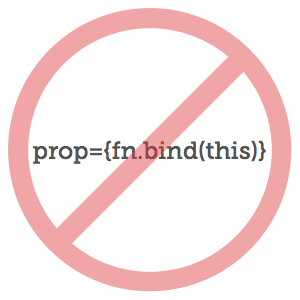 That about covers the ways to bind the functions you’re passing to props. Know of any other ways? Got a favorite one? Let us know in the comments.